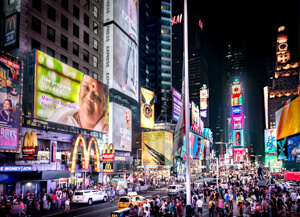 Amma’s 32nd visit to New York took place in the heart of Manhattan — Times Square. 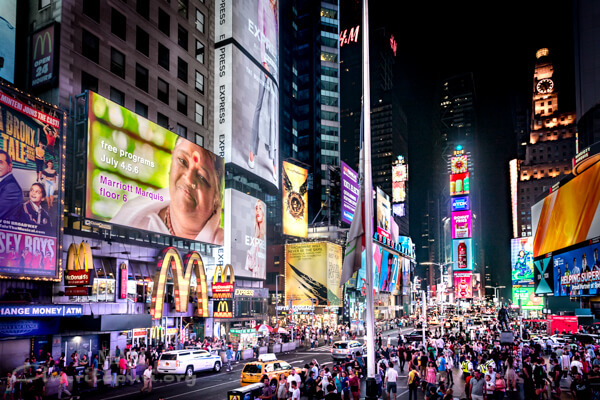 Amma’s face was shining on Broadway — adding a touch of the spiritual amongst the glittering advertisements of Times Square, attracting thousands walking the street to come and receive her embrace. 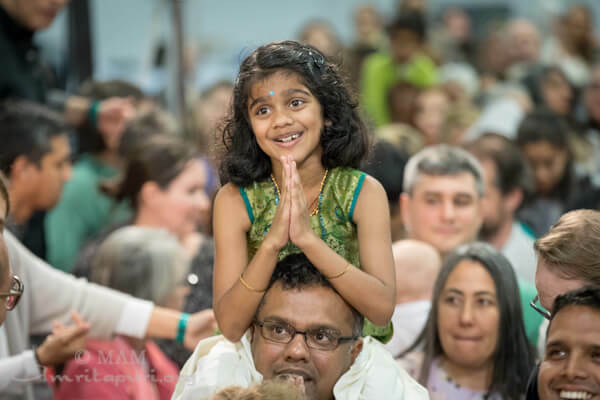 The program — as always — was marked by musicians and artists making their annual pilgrimage to receive Amma’s embrace and offer their performances. The first day welcomed a performance by “Samuel J,” a prominent vocalist, composer, producer who identifies with Amma’s message of love and respect for Nature and expresses this through his music. And the second day found longtime Amma devotee and rock guitar legend J Mascis performing with devotees Devadas Labrecque and Tony Jarvis. 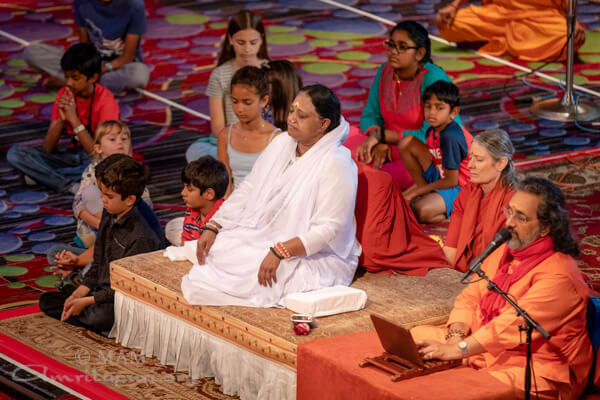 At the end of the first night of embracing people all day, Amma herself rocked the room by singing a new Punjabi bhajan: Jaga Janani Tu De Bhakti Tu. The crowd joyfully sang and danced along as the song got faster and faster. AYUDH Americas members, excited to represent their Mexico chapter, received seven saplings to be planted as part of the United Nations’ billion tree campaign as well as their youth-designed Nurturing Nature initiative. 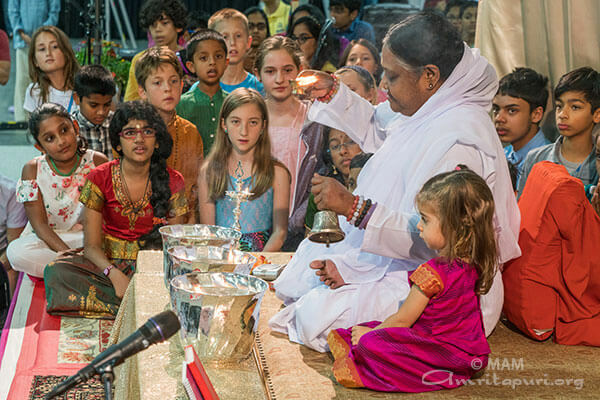 Amma’s stop in New York marked the second year of the opening of her brand new New Rochelle center. 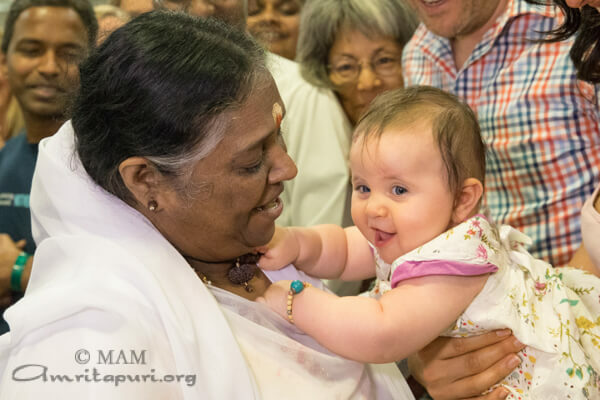 The center is now a hub Amma’s spiritual and humanitarian efforts in the region, home to monthly satsangs and prayers for peace, weekly soup-kitchen drives and various Nature-oriented efforts. 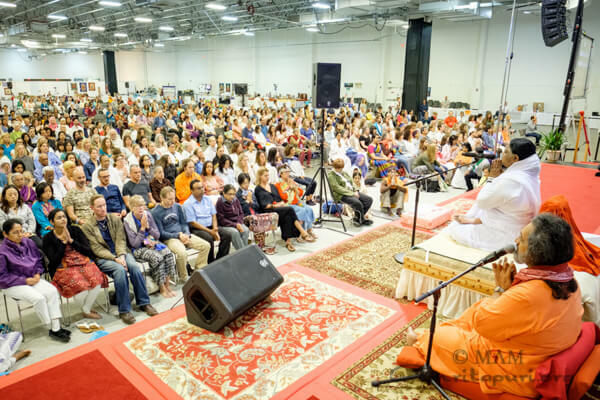 Amma held three days of programs at the Meadowlands Exhibition Center in Secaucus, NJ just outside of New York City. 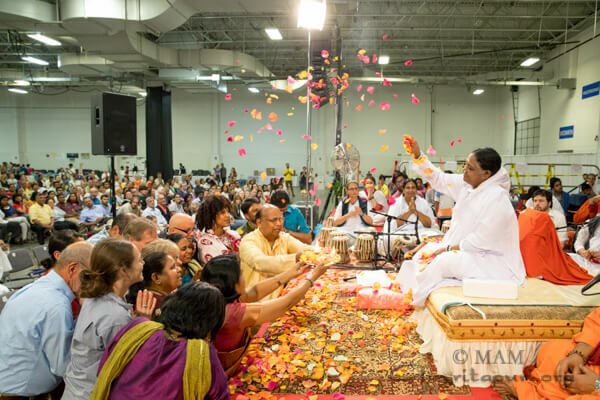 It marked the first time in many years that Amma has held programs in New Jersey rather than in New York City. 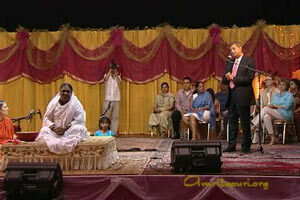 A brief ceremony celebrating Amma’s 30th visit to the US was held just before the Atma Puja on the last night. 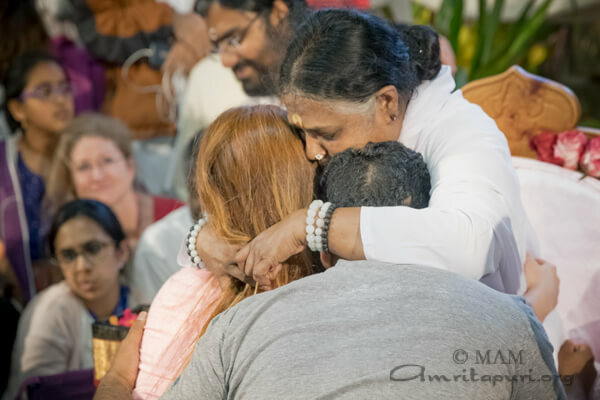 Kathy Miller (Vatsala) welcomed Amma as Sadhu Chaitanyan garlanded Amma on behalf of all those who had first met Amma in the New York Metropolitan area 30 years ago. They each then offered flowers at Amma’s feet. 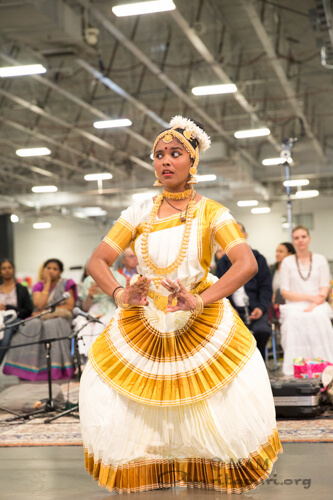 During the programs, local devotees put on cultural performances including traditional Indian dances. The crowd erupted in applause when it was announced that there is now a new MA Center in New Rochelle, NY. Amma blessed two saplings which will be planted on the grounds of the new Ashram. After Devi Bhava, Amma headed to the new Ashram. 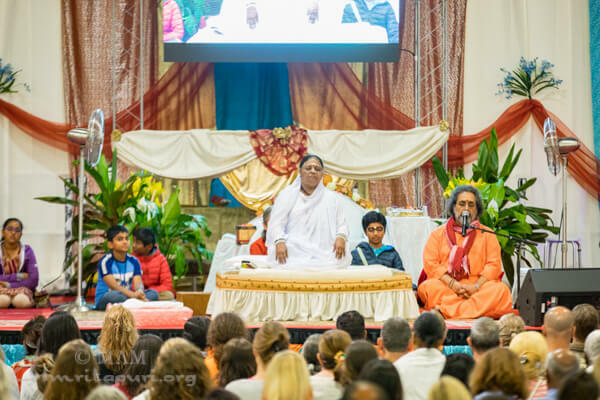 Located on approximately three acres, the Ashram sits directly on Long Island Sound and offers beautiful views of the water and nearby islands. 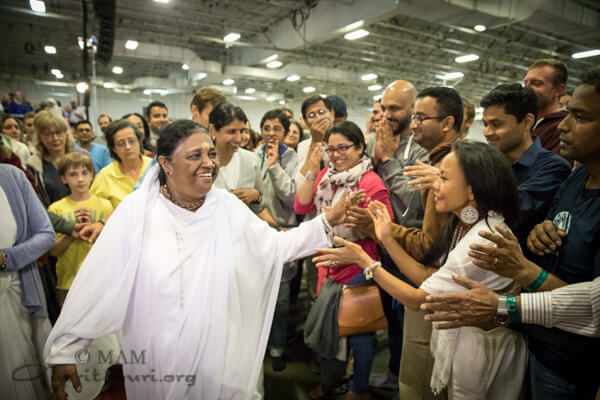 Amma led all the devotees in meditation and served everyone dinner before heading to New England for the next programs. 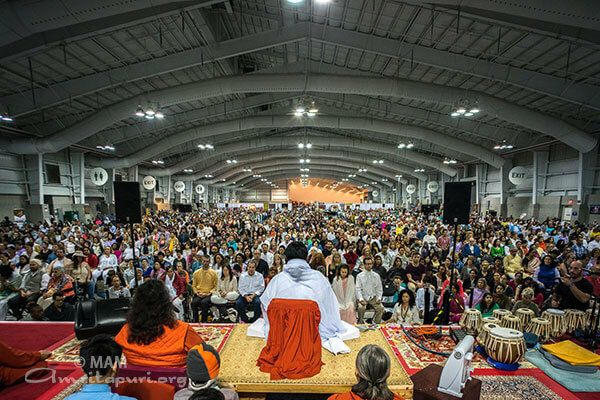 Amma returned to the Jacob Javits Convention Center in New York City for the 5th consecutive year to hold three days of programs. 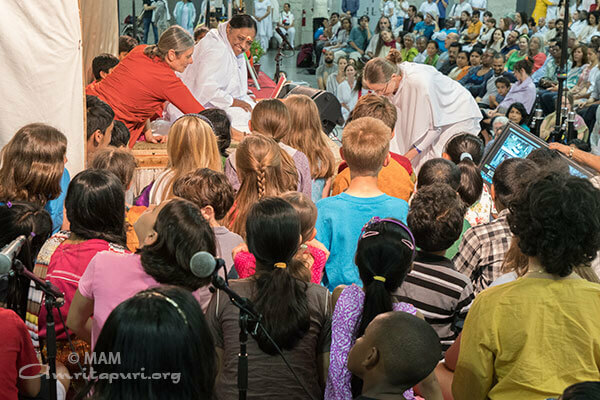 Thousands of people from the metropolitan area came for Amma’s darshan. 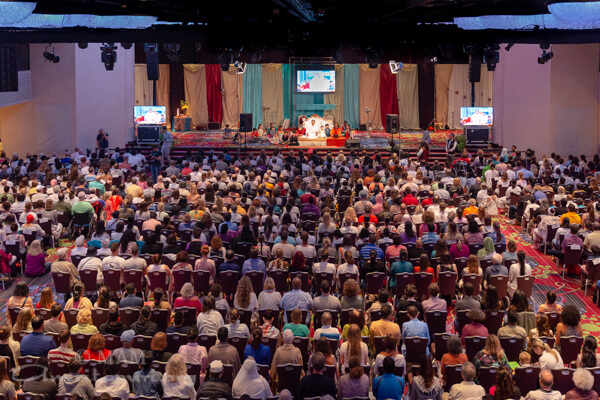 71 students from Columbia University’s Spirituality Mind Body Institute also came to see Amma and inquired how they could help with Embracing the World. 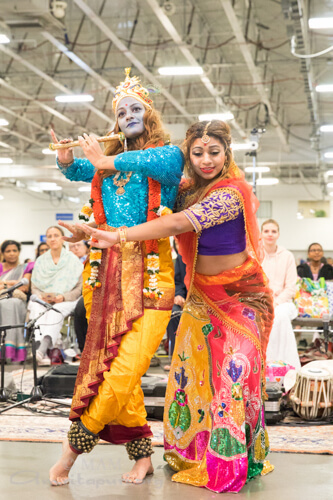 During the programs, local devotees sang bhajans and put on traditional Indian dances. 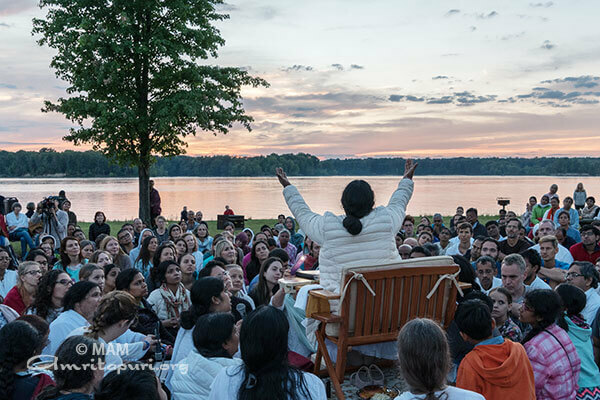 On the road from Chicago to New York, Amma stopped with the tour group to meditate and sing. Here she is singing in praise of the Creator who is one with creation. 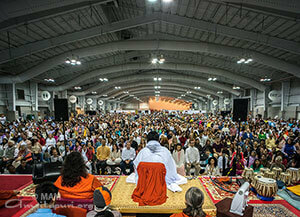 Amma held three days of programs at the Jacob Javits Convention Center located on the Hudson River in New York City. This was Amma’s third visit to Javits. The first day saw huge crowds coming for Amma’s embrace. 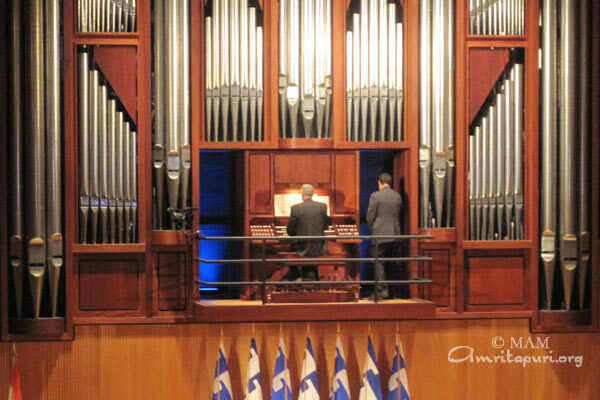 The day-long program started at 11am and went straight through until 12:55am. Amma had been sitting for almost 14 hours! 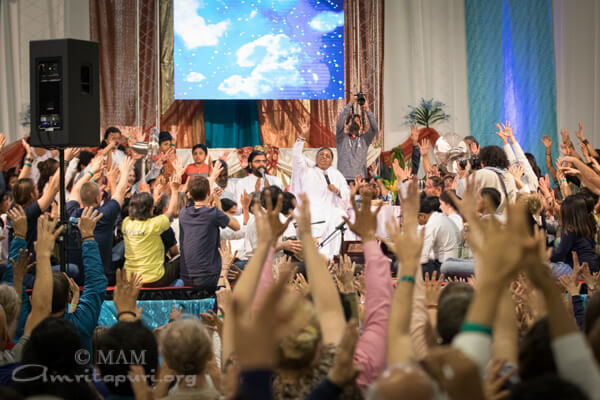 On the third evening, towards the end of Devi Bhava, in what has become an annual tradition, the famous rap singer, Doug-E Fresh entertained the crowd with his trademark ‘beat-box’ singing. 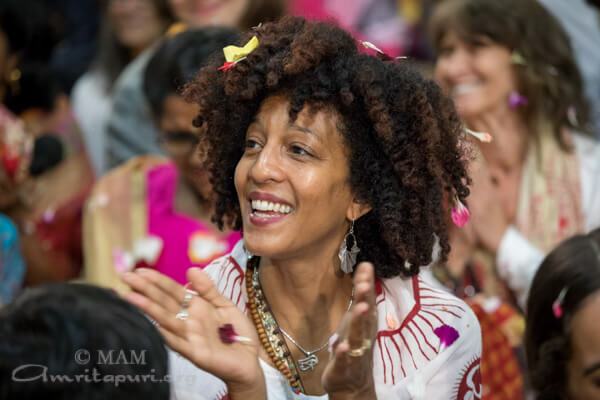 Devi Bhava ended at 10:01am the next day. I offer my humble salutations to all the dignitaries gathered here today. 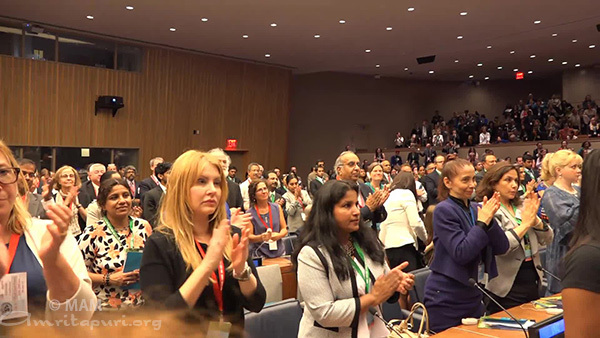 I would also like to take this opportunity to express my heartfelt gratitude to the United Nations Academic Impact for organizing this event, and to the principles of unity that the United Nations represents. 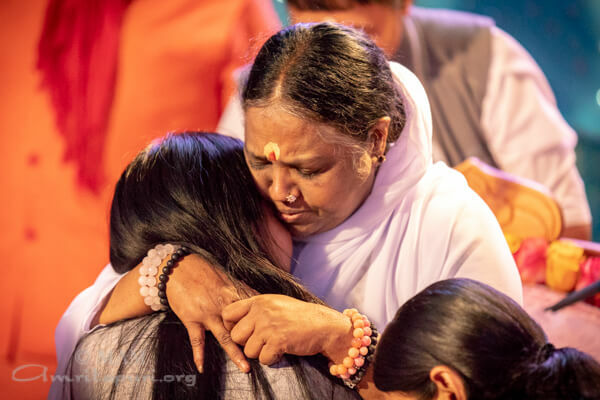 Some of you may wonder, “Does a spiritual person like Amma have a place here?” It is my faith in the validity of spiritual knowledge that has brought me here in front of you today. I often reflect deeply on the future of the Earth, the preservation of nature, and the disappearing harmony between humanity and nature. 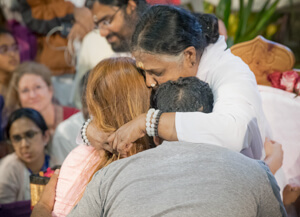 This contemplation has led me to the conviction that science, technology, and spirituality must unite in order to ensure a sustainable and balanced existence of our world. The present age and the world around us demand this transformation. Day by day, science and technology are rapidly growing in an uncontrollable manner. No one knows where this growth is leading. When we look around, we see developers, producers, distributors and consumers all seem to be caught in a frenzy to acquire the latest, greatest and largest things. The current state of humanity is like that of a child let loose in a candy store. Today, while lying in our bed we can order anything to eat, drink, watch or listen to, and it will be delivered right to our home. We don’t need to go to a store anymore to buy new or used things. There are websites for anything and everything. The Internet is revolutionizing the world, which is good. Now, we can buy anything with a single click of our finger—except one thing: love. We all have air-conditioned houses, cars and offices. But many people cannot fall asleep in their air-conditioned rooms, and must depend on sleeping pills. Some even commit suicide in their air-conditioned mansions. What does this mean? We cannot find peace of mind through external comforts alone. For this, we need to air-condition the mind. Spirituality helps to achieve this. We live in the age of the Internet. Wherever we go on the planet, we need to have Internet. But along with a connection to the Internet, we also need to rediscover our “Inner-net” connection. Spirituality teaches us how to manage both our internal and external worlds. For one who knows how to swim, frolicking in the ocean waves is a delightful experience, but one who is unable to swim will quickly drown. What is happening to society? Caught up in the speed of life, mankind has forgotten basic human values; we belittle their significance. We attempt to justify all the violence and unrighteousness we commit, from the individual level to the international level. We then thrust our rationalization of these actions on the rest of society. The Internet is revolutionizing the world, which is good. Now, we can buy anything with a single click of our finger—except one thing: love. There have been problems in the world from the beginning of time. For ages, society has suffered from war, conflict, discrimination based on caste, creed and social position, as well as disharmony in the family. But our ancestors had a different outlook on life. They had an inherent awareness of three factors: humans, nature, and the invisible power that harmoniously unites them. Their vision of life did not only take into account the physical existence of individuals and nature. They believed in a power that forms the foundation of nature and every living being—an invisible power that connects all beings with nature. They recognized this power as the most important part of life. They also believed that all of nature and each and every living being in the universe are like beads of variable forms and sizes, strung on a single thread of creation. This is why they gave so much importance to sharing, caring, consideration and empathy. Today, we have labeled this mentality as “primitive,” rejecting their way of living. Looking at modern life, we see a society of plenty steeped in misery. Excessive greed has blinded mankind, and the incidence of inhumane actions is on the rise, as a result. Mental agitation and stress have caused new and hitherto unknown kinds of diseases. Humanity is at a crossroads. At present, mankind lives solely depending on science and technology. However, in light of our current situation, we should at least try to incorporate spiritual thinking as well. 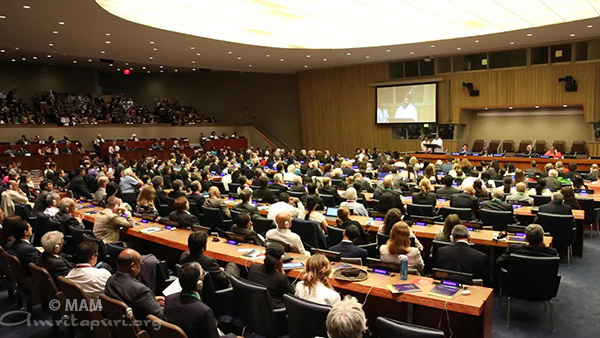 Recently, we have witnessed so many natural calamities and alarming changes in the global climate, including rapidly increasing global warming. We need to ponder deeply on whether human effort alone will be enough to put a halt to the imminent worldwide catastrophe. In the olden days, because people lived in tune with nature, they would look for an auspicious day before planting or cutting down a tree. Before cutting a tree, people would first worship it and then apologize, saying, “Please forgive me for the action I am about to perform. It is only out of necessity that I am cutting you down.” But, what happens today? Not only do we rarely plant trees, we relentlessly destroy them and all of nature. When Amma was a child, people would apply cow dung to their wounds. This would help them heal faster and prevent infection. But if we were to do the same today, our wound would instantly become infected. What used to be medicinal in the past has now turned poisonous. This is how polluted nature has become. Just as we celebrate Mother’s Day, Father’s Day, Valentine’s Day and Thanksgiving with a lot of fanfare, we should have a day to respect and worship Mother Nature. On that day, everyone in the world should try to plant at least one tree. This could even be on New Year’s Day, so we start the year on an auspicious note. If we do so, this planet will become a paradise. A tree is like a house that we construct for Mother Earth. There is a rhythm to everything in creation, an undeniable relationship between the entire universe and every living creature in it. The universe is like a vast interconnected network. Suppose there is a net. If it is shaken in one place, the vibration is felt throughout. Similarly, whether we are aware of it or not, all of our actions reverberate throughout creation—whether performed as an individual or as a group. We are not individual islands but links of a common chain. Harmony exists when man, nature, and the power beyond both of them function as one. However, now we only give importance to human beings and their discoveries. Our lives today have no place for values. The general belief is that values are irrelevant and superfluous. In order for any engine to function smoothly, it needs oil. The “oil” that helps us live without much friction is our values. These values are developed through spiritual thinking. There are two types of education: education for a living and education for life. When we study in college, striving to become a doctor, lawyer, or engineer, this is education for a living. On the other hand, education for life requires an understanding of the essential principles of spirituality. The real goal of education is not to create people who can understand only the language of machines. The main purpose of education should be to impart a culture of the heart—a culture based on enduring values. Spirituality is also a science—it is a valid branch of knowledge that cannot be ignored. The scientific community is researching the physical world in an attempt to discover the secrets of the universe. In reality, spiritual scriptures recount the experiences of those who performed intense inner inquiry in order to unfold the same secrets. When we try to view spirituality through mathematics, physics and logic alone, we may fail to grasp its subtleties. We need to approach it with the faith of a child, and with the wonder that shines in a child’s mind and eyes. Renowned scientists of the past viewed the universe and its subtleties with awe and wonderment. Their research had the inquisitiveness and faith of an innocent child. In fact, many past and present eminent scientists acknowledged spirituality towards the end of their lives, but by then it was too late. 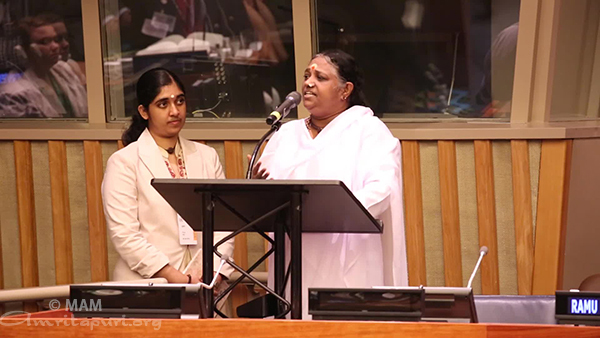 Amma prays that the scientific community leading the world today does not make this same mistake. Life is a perfect combination of logic and mystery—perhaps more mysterious than logical. In all areas of life, the head and heart should go together. For example, when white sand and sugar are mixed together, it is very difficult to separate the two, even for an intelligent human being. However, the seemingly insignificant ant—representing humility—will come and easily manage to eat only the sugar. Amma was born in a small fishing village, where 90 percent of the people lived off daily wages. Many people in the village had valvular heart disease. Even though they were diagnosed with blocks in their cardiac valve, they could not undergo surgery as the valves were only available from abroad and were very costly. So, people who should have lived until age 70 or 80 died by the time they were thirty or 40. Amma would think, “If only we could find a way to make valves that were not so expensive.” This is how Amma became interested in doing research for the sake of serving the poor. Infant mortality is a major issue in many countries. To investigate the causes of this trend, we visited many villages in India. In some villages, we saw that women were eating mainly herbs and shrubs. When asked why this was the case, the explained, “Our husbands earn daily wages and they only find work every three to four days. Due to our lack of income, we get very little food and we end up giving this to our husbands. In order to suppress our hunger, we eat these specific herbs and shrubs.” They subsist on the same diet even while they are pregnant. How will the children born of such malnourished women survive? In some villages, women have no education and are illiterate, so their husbands easily exploit them by forging their signatures even for what little government aid they could have received. This is why we started literacy programs for women. We also decided to give these women vocational training using haptic devices. The current gap between the haves and the have-nots is the bane of the entire world, and this disparity is increasing daily. A mountain on one side and an abyss on the other—such is the current situation. On one hand, there are those who live, squandering millions upon millions on luxuries. On the other hand, there are those who struggle in hunger and pain to make enough for just one meal—to make enough for just one day’s medicine. If we postpone reducing this gap any longer, it will culminate in violence, even widespread riots. A bridge of love and compassion joining these two groups is desperately needed. Poverty is a terrible plight upon humanity, destroying all goodness and talent. It is the cause of all moral degradation. 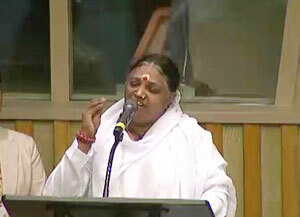 “Can’t your father work to earn money?” Amma asked. The personal experiences and situations witnessed by children make deep impressions in their minds. Poverty and the sense of inferiority it creates often manifest as violent tendencies, even at a very young age. This is how the values in society erode. Love and compassion are especially needed in such situations. Many people are cynical about spirituality. What is spirituality? True spirituality is compassion in action; it begins and culminates in compassion. If we could transform compassion from a mere word into a path of action, we would be able to solve 90 percent of the world’s humanitarian problems. The first step to helping others is imparting awareness. In spite of taking regular medication, if a diabetic continues to eat sweet food, their blood sugar level will increase. So, diet control and lifestyle modification are as important as medication. Amma remembers an incident that happened in one of the villages that we adopted [as part of Amrita Serve or Live-in-Labs Project]. Initially, we taught a core group of people in each village about toilet building, and we left the actual building to them. When we revisited these villages after a while, we noticed that people were not using the toilets. They would open the door of their new restroom, look inside as though they were visiting a temple, then they would close the door and go to the nearby lake to relieve themselves, as usual. At this point, we began educating the villagers, explaining that open defecation leads to water and soil pollution, which further contaminates our food and leads to all kind of parasitic infections, such as hookworm, etc. This helped in creating the much-needed awareness in the community. When we try to love or serve without understanding those whom we are serving, we often end up harming society and ourselves. In order for service to be beneficial, it needs to go hand and hand with discernment. This is the essence of sustainable development. A fish was splashing about in the river. A monkey that had come to quench his thirst noticed the fish. He thought, “That poor fish is suffering, trapped by the current. I must save it!” In his impulsive sympathy, the monkey rushed over to catch the fish, and placed it on the riverbank. The fish started gasping for air and died soon after. What if the monkey had tried to understand the fish before removing it from the water? What if he had asked, “May I take you out of the water?” The fish would have replied, “Oh, no! If you do that, I’ll die!” Acting without understanding is akin to the monkey’s attempt to save the fish. The heart and intellect must come together in all of our actions. 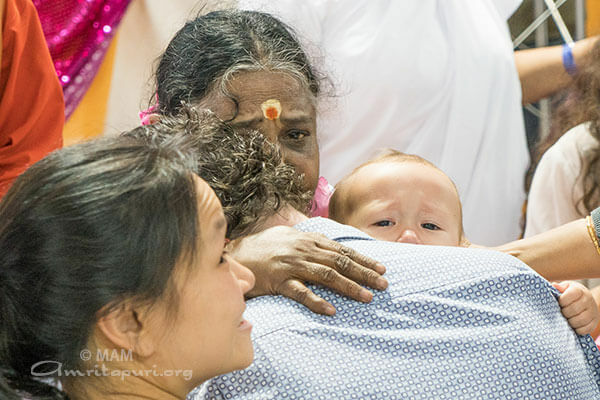 Once, a man brought a 10-year-old boy to Amma. He wanted Amma to raise the boy in the ashram and told her the story of how he became an orphan. His father had died two years before, so his mother and sister went to work in a candle factory near their home. Then his mother was diagnosed with chronic kidney disease and was unable to work as she was bedridden. Even though his sister was paid very little, it was just enough to make ends meet. After a while, laws were established that banned child labor. The owner of the candle factory was arrested, and his company was shut down. All the children working there were let go. Distraught at the loss of their only source of income, the mother sent her son to school in the morning and then she poisoned her daughter and herself. It is justifiable to shut down such factories, but we often forget the families of the young children who depend on these factories in order to live. In our attempt to resolve a problem, if we only see one aspect and fail to see the other, the repercussions are experienced by people who have no other recourse. 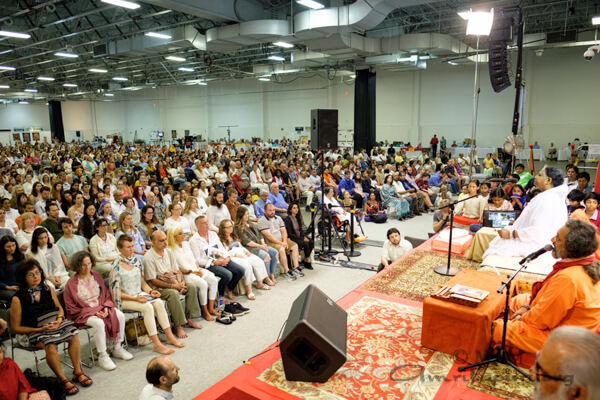 People ask, “What is the significance of spirituality?” Spirituality helps us to develop the discernment to differentiate between what is essential and what is excessive. For example, we need a watch to tell time. Both a $100 and a $50,000 watch will do that. If we buy the $100 dollar watch and use the remaining money to help the poor, it would be a great service to society. Though we may see a thousand suns reflected in a thousand pots of water, there is really only one sun. Likewise, the consciousness within all of us is one and the same. With such an attitude, we will be able to cultivate a mind that considers others before ourselves. Just as our right hand rushes to comfort our left hand if it is in pain, may we love and serve others as we would our self. There are two types of poverty in the world. The first type is due to the lack of food, clothing and shelter. The second type is the poverty of love and compassion. We need to tackle the second type of poverty first. For, if we have love and compassion, we will wholeheartedly serve and help those who lack food, clothing and shelter. We must become the hands, eyes and ears of God. Our inspiration, strength and courage must come from God. Then, fear, doubt and sin will never stain us. The sun does not require candlelight. Similarly, God needs nothing from us. Sooner or later, the body will perish. Therefore, isn’t it better for it to wear out from activity than to let it rust away from lack of use? Otherwise what’s the difference between people and worms? Worms also eat, sleep, reproduce and eventually die. What more are we doing with our lives? Children, whether or not God exists might be a source of debate. Whatever be the case, no rational person can ever say that suffering humanity does not exist; we can see suffering with our own eyes. 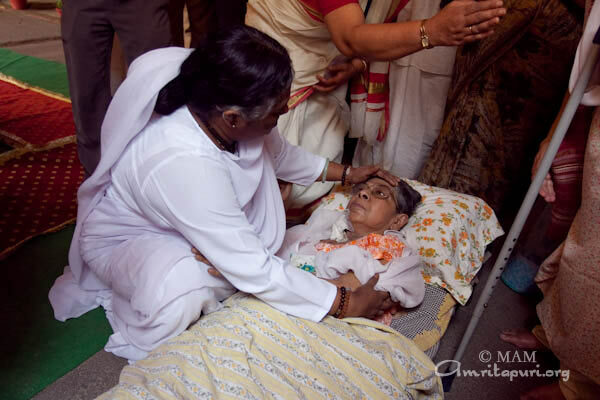 Amma considers service to such people to be worship of God. Amma prays that this self-sacrificing attitude awakens in her children. May the world come to realize through all of you that the waters of love, compassion, selflessness and sacrifice have not dried up in human hearts. In the village where Amma was born, there was only one faucet for about 1,000 families. At most, each person could fill only one pot of water, but that itself would require waiting from morning until night. Sometimes, we wouldn’t end up getting any water at all. Because of these experiences, if Amma ever sees water leaking from a tap, she feels like her blood is pouring in place of the water. We may think, “How can we stop wasting water? Who do we turn to for a solution?” Amma lived without even basic amenities and witnessed the suffering of those around her. As a result, whenever she sees another person in pain, she instinctively feels the need to help them. Nature is our mother. While our birth mother may keep us on her lap for a few years, Mother Nature keeps us on her lap for our entire lifetime. Amma has one wish. All universities should send their students to impoverished rural villages or city slums for at least one or two months during their education. They would be able to see directly the issues and problems that the poor face. They could then develop solutions and write papers on everything they studied. This would help us to help the poor in the most effective way and, at the same time, awaken compassion in today’s youth. Today, universities and their researchers are ranked mainly based on the amount of funding they receive, the number of papers they publish and their intellectual caliber. Faculty are promoted according to the same criteria as well. Along with this, we should take into consideration how much we have been able to use their research to serve the lowest and most vulnerable strata of society. This would be like gold becoming fragrant. 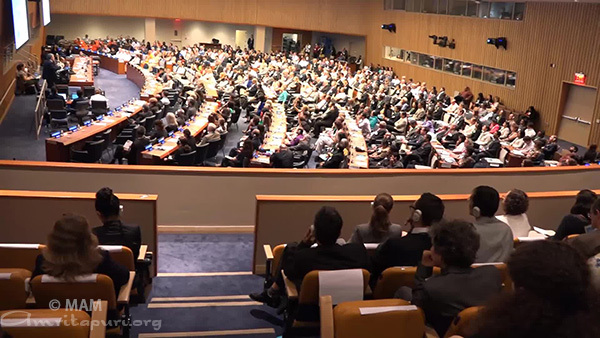 In our approach to sustainable development, we should not forget that it is by strengthening the people at the base of the pyramid that the entire edifice of society becomes healthy and strong. Segregating science and spirituality has been the greatest crime against humanity in the past century. These two main branches of knowledge that should have gone hand in hand were divided and practitioners were either labeled as modern scientists or representatives of religious faiths. “Only scientific discoveries apply to logic and intelligence. They are the only truth. Religious faith is blind and misguided.” This was the ideology that was popularized. All the recent natural disasters and the alarming changes in the global climate are challenging the further survival of this beautiful earth we live in. Now, many people cannot help thinking that all this may be the result of weighing science and spirituality on opposite sides of a scale and deeming that one is much greater than the other. If we want our actions to bear the desired results, three factors are needed: the proper time, self-effort and God’s grace. 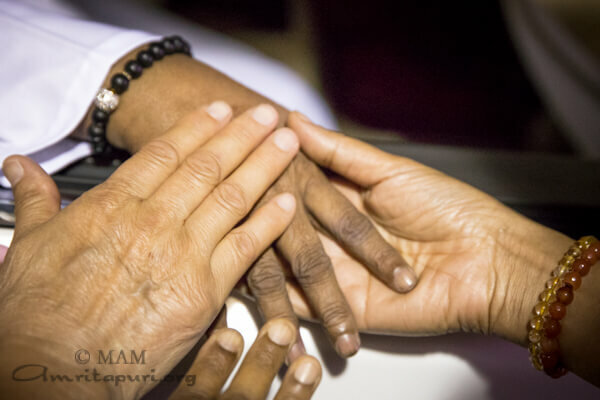 Amma gives the example of a man has to travel a long distance in order to attend a job interview. He wakes up early in the morning, gets in the car and reaches the airport on time. However, after checking in, he hears that the plane’s engine is having some mechanical problem or the weather is too bad to fly; so the flight is cancelled. In this case, the man put forth enough effort and he reached the airport at the correct time, but because he didn’t have grace, he was unable to attend the interview. Similarly, we need God’s grace to make all our actions complete and meaningful. Spiritual practices and compassion are not two, but one. It is our own selfless actions that come back to us as God’s grace. May the tree of our lives be rooted in the soil of love. May good deeds be the leaves, kind words be the flowers, and peace be the fruit. May the world flourish as one family, united in love. May we thus be able to create a world in which peace and contentment prevail. This is Amma’s sincere prayer. 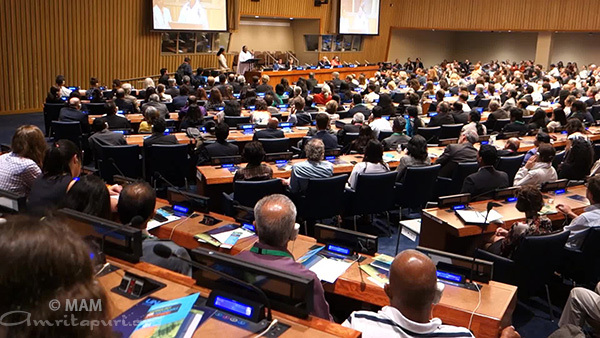 Amma will deliver the keynote address during the coming conference at the United Nations on technology and sustainable development in New York. The faculty from the University will later present research work they have undertaken in collaboration with renowned universities such as Cambridge, EPFL, Monash, the National University of Singapore, Oxford, Stanford and Twente. 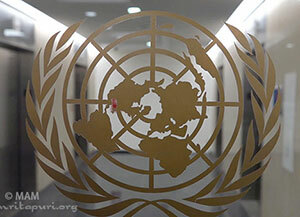 United Nations Academic Impact (UNAI) is a global initiative that aligns institutions of higher education with the U.N. 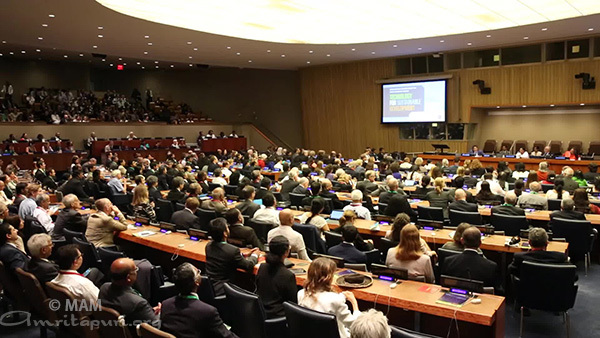 In furthering the realisation of the purposes and mandate of the U.N, through activities and research in a shared culture of intellectual social responsibility, an online portal created by Amrita University would also be inaugurated. 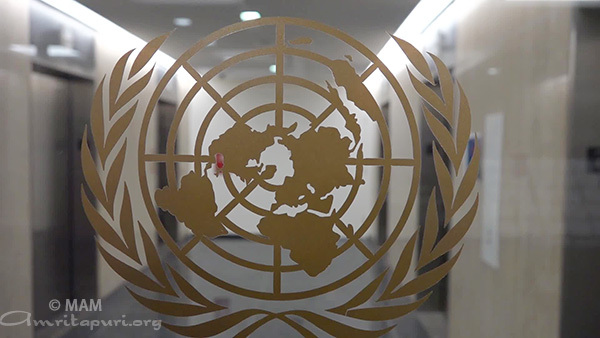 The portal would encourage discussions and collaborations among university researchers worldwide on technology for global sustainable development. 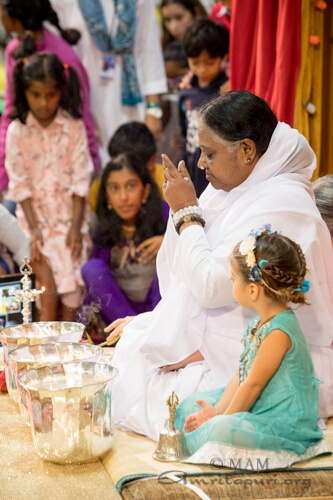 When Amma came to New York, it was in the midst of the Fourth of July Independence Day holidays. The city was alive with celebration, and millions of dollars in fireworks were being set off over the Hudson River. 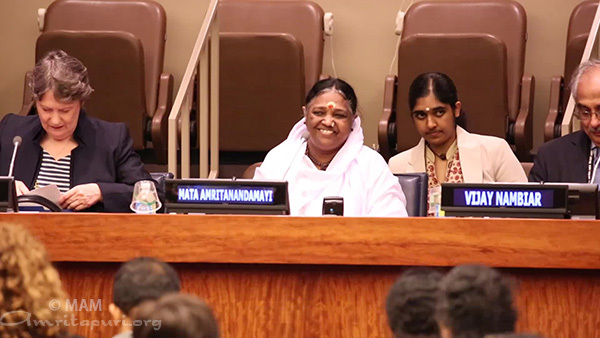 The next evening, Amma was officially welcomed to the city by a number of figures from both the United Nations and the New York City government. 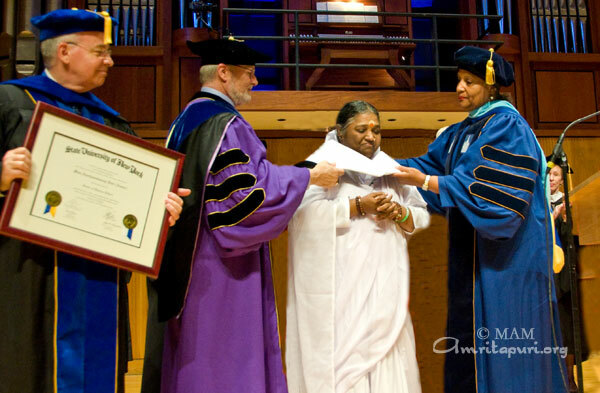 The State University of New York (SUNY) presented Amma with an honorary doctorate in humane letters at a special ceremony held on May 25 at Lippes Concert Hall in Slee Hall on the University at Buffalo North Campus. 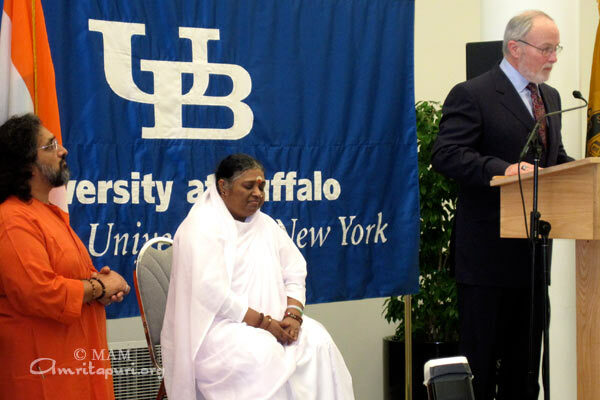 Dr. John B. Simpson, the President of State University of New York at Buffalo, addressed the gathering, which included a mix of SUNY Buffalo faculty and students, as well as faculties from Amrita University. “Through this conferral, we pay tribute to the far-reaching contributions of a distinguished educational leader, prominent humanitarian and esteemed spiritual leader. Through her leadership of Amrita University as well as through her humanitarian work, Chancellor Amma exemplifies the value of international dialogue and dedicated public service in the global arena. These are values at the core of the University at Buffalo’s mission as an internationalized public university seeking to prepare our students to contribute meaningfully to the global world,” he said. 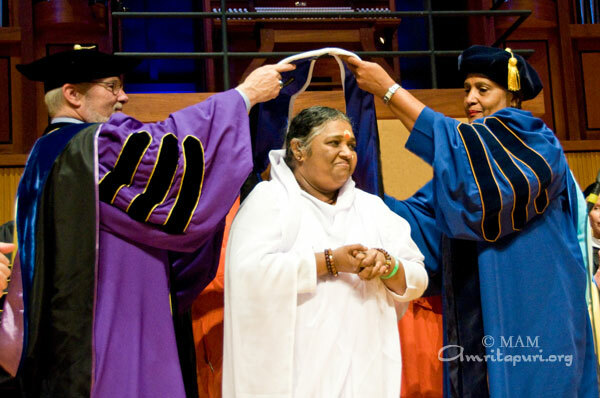 President Simpson and SUNY Lewin then placed the ceremonial cowl over Amma’s shoulders to thunderous applause. Amma is the first Indian to receive this honour. Amma then delivered an address on education, in which she discussed the importance of including universal spiritual values in core curricula, the role of meditation in developing and gaining control over the mind, and the complimentary relationship of scientific knowledge and spiritual wisdom, among other topics. 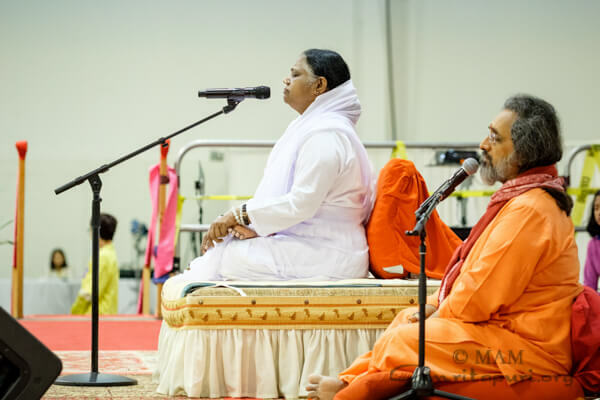 Amma said, “It is Amma’s prayer that we develop the expansive-mindedness to embrace both scientific knowledge and spiritual wisdom. We can no longer afford to see these two streams of knowledge as flowing in opposite directions. In truth, they compliment one another. If we merge these streams, we will find that we are able to create a mighty river—a river whose waters can remove suffering and spread life to all of humanity. Other dignitaries to address the gathering included Dr. Satish K. Tripathi, Provost of University at Buffalo, and Dr. Stephen Dunnett, University at Buffalo, Vice-Provost for International Education. “Because of Chancellor Amma’s vision, thoughtful leadership and commitment to academic excellence, the University at Buffalo and Amrita University faculty and students have benefitted from an ambitious educational and research partnership,” said UB Provost Satish K. Tripathi. “As the UB/Amrita partnership has grown, I know it has been largely due to Amma’s behind-the-scenes role in nurturing and encouraging our institutional relationship. From the beginning, she has seen the potential of this partnership for the benefit of our respective universities and our faculty and students. 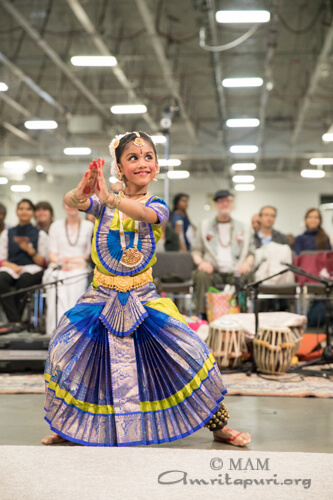 The ceremony was exquisitely arranged with performances of both classical music both from India and the West, including organ performances by University at Buffalo faculty Roland E. Martin and students of the Natya School of Indican Classical Dance in Buffalo, directed by Tejaswini Rao. 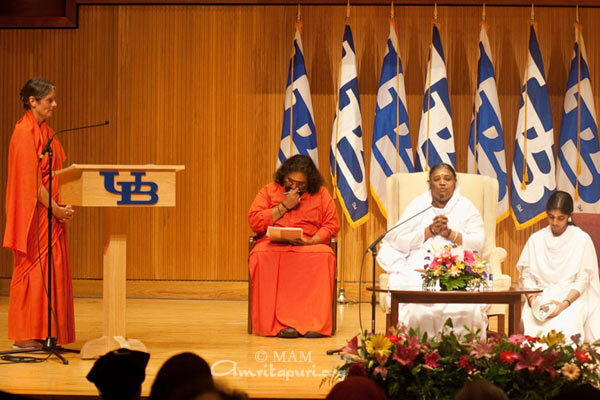 The State University of New York (SUNY) presented spiritual leader and humanitarian Sri Mata Amritanandamayi Devi (Amma) with an honorary doctorate in humane letters at a special ceremony held at 2 p.m. on May 25 at Lippes Concert Hall in Slee Hall on the University at Buffalo North Campus. 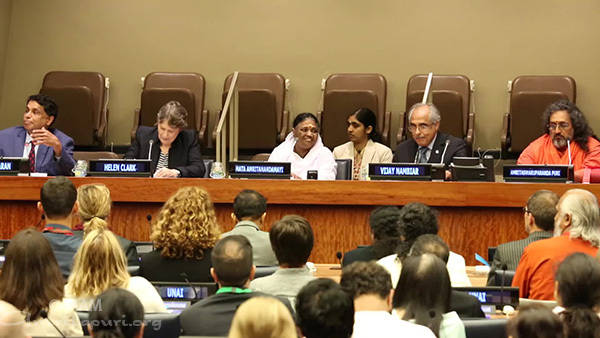 SUNY bestowed the doctorate upon Amma in recognition of her tireless efforts on behalf of global peace, for her commitment to education and for the far-reaching impact of her charitable organizations in relieving poverty and human suffering in India and around the world. As part of the award ceremony, Amma delivered an address on education, in which she discussed the importance of including universal spiritual values in core curricula, the role of meditation in developing and gaining control over the mind, and the complimentary relationship of scientific knowledge and spiritual wisdom, among other topics. SUNY is a renowned public university with 64 campuses across the state of New York. Its four main centers are in Albany, Binghamton, Buffalo and Stonybrook. Its total student body is 440,000 students. 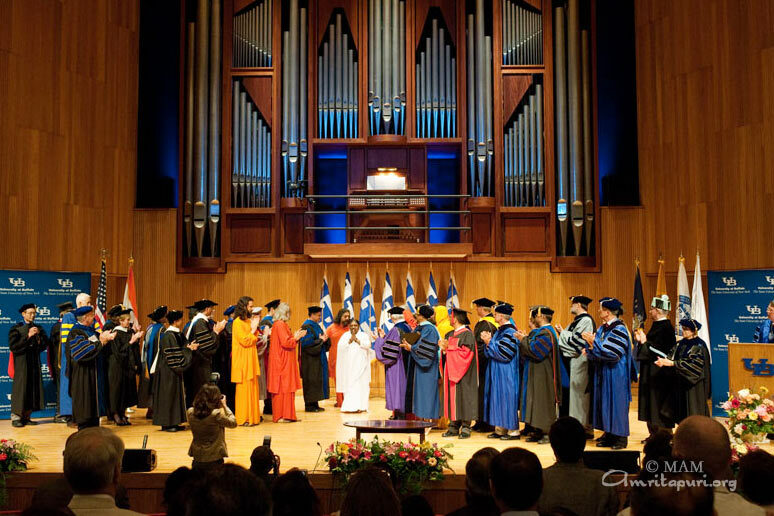 Others receiving honorary doctorates from SUNY this year include MapQuest founder Barry Glick, pioneering AIDS/HIV- researcher Dr. Robert Vince, and Pulitzer Prize-winning composer Steve Reich. 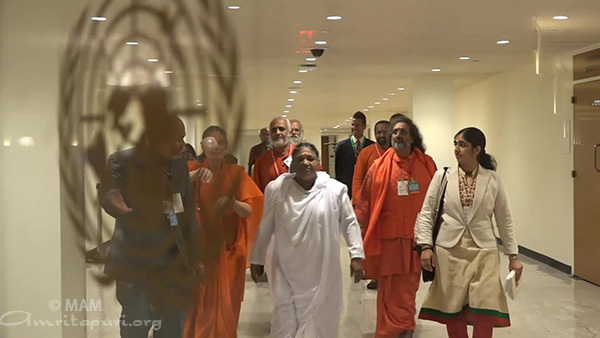 The State University of New York (SUNY) will present spiritual leader and humanitarian Sri Mata Amritanandamayi Devi (Amma) with an honorary doctorate in humane letters at a special ceremony to be held on May 25 at its campus in Buffalo. 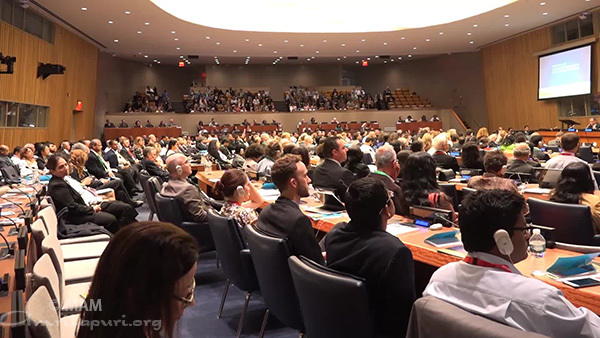 SUNY is bestowing the doctorate upon Amma in recognition of her tireless efforts on behalf of global peace, for her commitment to education and for the far-reaching impact of her charitable organizations in relieving poverty and human suffering in India and around the world.